Russia has charged three police officials with criminal negligence over the Beslan school siege, in which an estimated 360 people were killed. Deputy police chiefs were charged in the North Ossetia region, where Beslan is located, and adjacent Ingushetia, where some hostage-takers came from. A prosecutor says inquiries continue into officials' poor performance. A BBC correspondent says the charges are the first to be brought in what is likely to be a lengthy investigation. Two police chiefs who are the direct bosses of the three men will be charged when they come out of hospital, where they are apparently being treated for complaints not linked to the siege. Two of those already charged are based in the Ossetian Pravoberezhny district and one in the Malgobek district of Ingushetia. Five bodies - those of two girls, two boys and a suspected male hostage-taker - remain unidentified since the siege, Russian prosecutors announced on Wednesday. The official Russian death toll stands at 360, of whom 172 were child hostages and 30 members of the gang which seized the school. Others killed include adult hostages and members of the security forces. Prosecutors will not give details of the charges, but a spokesman told the BBC the list was long. It is thought to include failure to provide adequate patrols of the border area, and responsibility for the presence of a rebel camp in Ingushetia. The only gunman captured alive by Russian forces says the hostage-takers trained there for their attack. 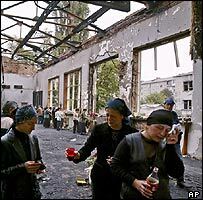 Residents of Beslan welcomed the charges as a start, though they are furious that the gunmen ever made it to their town. Many believe the gunmen bribed their way through police checkpoints. Correspondents say many local people blame the police for not preventing the militants from entering the school and for not keeping local militiamen away once the shooting started. More than 1,000 people were taken hostage after more than 30 armed men seized the school during a ceremony to mark the first day of term on 1 September. A siege ended in bloodshed two days later when explosives planted by the hostage-takers went off inside and special forces stormed the building. Half the victims were children. Chechen warlord Shamil Basayev later took responsibility for the hostage-taking and other recent attacks on civilians in Russia. The Russian parliament is conducting an investigation of its own into the events.